Savvii is a European managed WordPress hosting provider that started in 2013. They make the process of running a WordPress site extremely easy. Read our review of their services below, along with a benchmark and pros and cons. First, a bit more information about Savvii. While they’re based in the Netherlands, they still serve customers from all around the world and they use English on their site. You can also access their website (along with their control panel and knowledgebase) in Dutch and German. They also offer chat/ticket support in Dutch, as well as English. Though Savvii started in 2013, they originated from a Dutch hosting provider VIP Internet that has more than 15 years of experience. All of Savvii’s team is a professional with a lot of experience in what they do. You can meet their team here. They use the servers from Linode, DigitalOcean, Exoscale, PCX, and Rackspace, which are some of the best cloud hosting providers out there. You get the best of both worlds with Savvii’s support and WordPress features and Linode/DO’s enterprise-grade servers. Savvii is a managed WordPress hosting provider so obviously, most of the work is done by them. WordPress along with PHP, the database, and everything else is installed and configured by default, you don’t have to do anything. As per usual with managed WordPress hosting providers, they’re full of features that help you out with managing and maintaining WordPress. We’ll focus on the main ones below. Savvii has an easy and simple to use control panel where you can manage your sites, orders/billing, backups, and everything else. You can activate automatic plugin and core (including major) updates with a single click – literally. It’s debatable whether or not you should allow auto plugin updates, or even core updates, but nevertheless, this feature is extremely useful and time-saving for people that do want to use auto updates. In case of major core updates, Savvii usually waits a few weeks before updating. You can read more about their update process here. The best thing about this feature is that it’s included for free with every hosting plan, including shared hosting plans. And let’s not forget the fact that activating them is extremely easy. The updates switches can be found on the control panel home page. You don’t have to dig around and search a whole control panel to find and activate auto plugin updates, which is the case with some hosting providers. 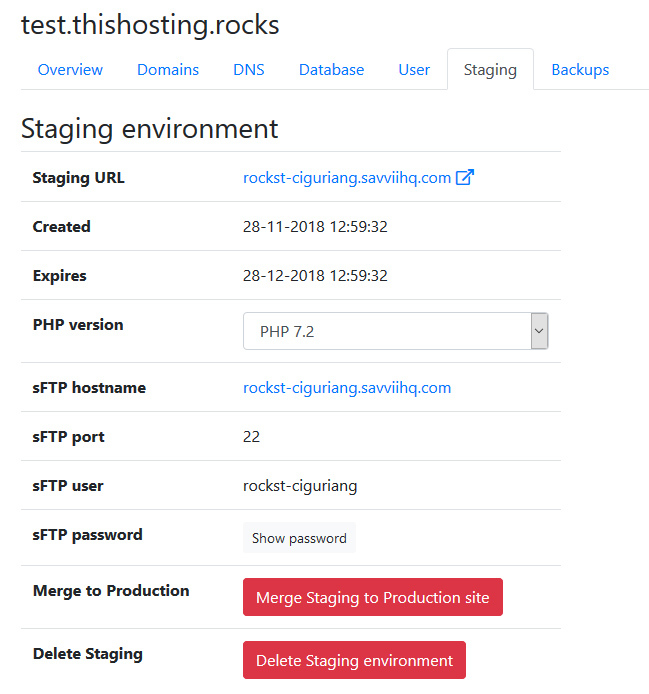 Savvii has a staging area in their control panel that you can activate with a single click, where you can manage the staging site (PHP version, SFTP access) and merge it with the production site with a single click. A staging site is a must-have for anyone that runs a WordPress website. 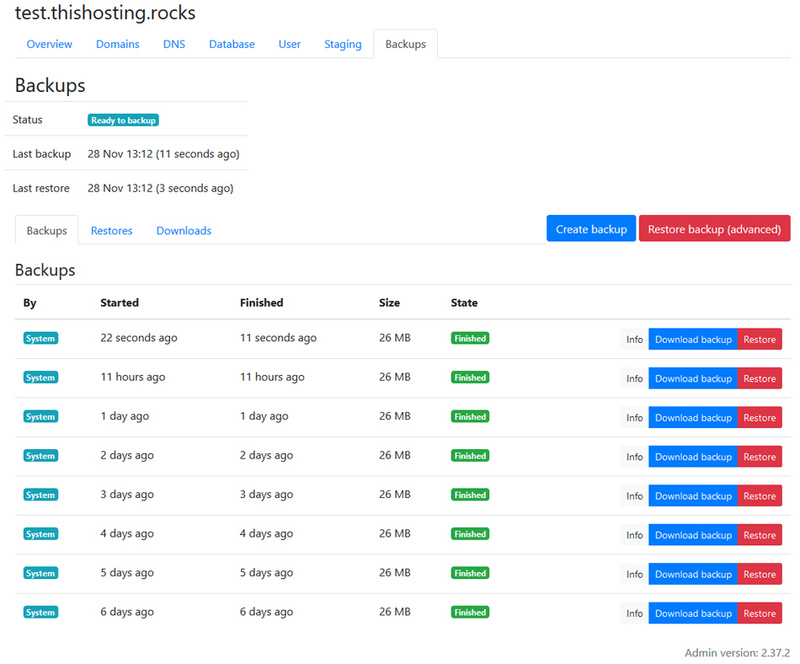 A staging area is a must-have for any managed WordPress hosting provider. Savvii, again, does it well, with making the whole process simple and easy. Most managed WP hosting providers do offer a staging area, but some of them are definitely not as easy to use as Savvii’s. Savvii will automatically backup your site on a daily basis. They back up the code, database, and uploads folder. You can download each backup separately or all altogether. Alternatively, you can also restore the backup with a single click, without downloading it yourself. They store the backups for 14 days. We don’t even have to mention this, but backing up your site on a regular basis is EXTREMELY important. Especially if you enable the automatic updates feature. Even though they do backups on a daily basis, we’d recommend doing manual backups at least once a week to a different server. Again, as per usual, Savvii enables you to initiate and restore a backup with a single click. Couldn’t be easier. Varnish cache installed and enabled by default on all hosting plans. Memcached installed on VPS plans. Free daily malware detection & clean-up. Optional paid Security Plus plan with emergency DDoS protection, a CDN, a firewall, 3-hour scans and more. Exclusive deals for WordPress plugins, themes, and tools for Savvii customers only. All of these features (with exceptions where noted) are available in all of their hosting plans. We normally do a simple speed test at WebPagetest.org for most hosting providers. We tested their cheapest shared (Shared One) and cheapest VPS plan (VPS One). We didn’t change, configure, or update anything in the sites. The default WP homepage for the shared hosting plan fully loaded in 0.934 seconds. You can check the full results here. The default WP homepage for the VPS hosting plan fully loaded in 0.961 seconds. All in all, a great result. Faster than the usual managed WP hosting provider. This is by no means a “good” benchmark of their servers. Even the speed test we do depends on what locations we select, what content is hosted etc. But since we do this for all hosting providers we can get a good comparison at the end. They don’t offer 24/7 support. Their support is still available on workdays and they’re quite helpful, but it’s only available 9 (or less Fridays) hours a day via chat or tickets. You can check their working hours here. Emergency 24/7 phone support is available for VPS customers only, and it’s for emergencies only (as in your site is down). Emergency support is not available for shared hosting plans at all. If you have a minor issue that needs fixing outside of working hours, you’ll have to wait. Shared hosting accounts are automatically rolled out in Germany. They currently don’t offer shared hosting plans with other locations. You have to state the server location you prefer in the Notes field during sign up. Unfortunately there’s no drop-down menu or any other selection at the moment. They’re working on this though and the location choice process will be more streamlined soon. They don’t offer emails and domains. This is by no means bad. We actually prefer when providers focus on what they know and what they do best. Savvii only offers Managed WordPress hosting and they do that great. Even if they did offer emails and domains, we wouldn’t recommend getting them from the same provider. You should always separate emails, domains, websites, and backups through different providers. Their knowledge base is quite extensive and full of information. If you have something to ask or need help with, chances are it’s already answered in their knowledge base. They are expensive, but it’s all relative. You get what you pay for after all. Considering all their features and quality of service, the price is definitely worth it. They offer an “Extended SLA” option as a paid addon, which is a sort of “VIP Support” – meaning you’ll get better support faster. You can get the details here. Though depending on your setup, this may not be worth it. You’ll still get relatively fast support even with the free option. Savvii is a great option if you need European managed WordPress hosting. They do the “managed WordPress” part right. They make the process of managing your site via their dashboard extremely easy. They offer a 14-day trial so you can try them out without committing to anything.